Overview: In my digital essay, I aim to analyze the (method)ologies of online resources which compile and remediate archival texts, using The Yellow Nineties Online as a case study to examine the ways in which digitizing encodes form and content, and therefore changes the audience interaction. 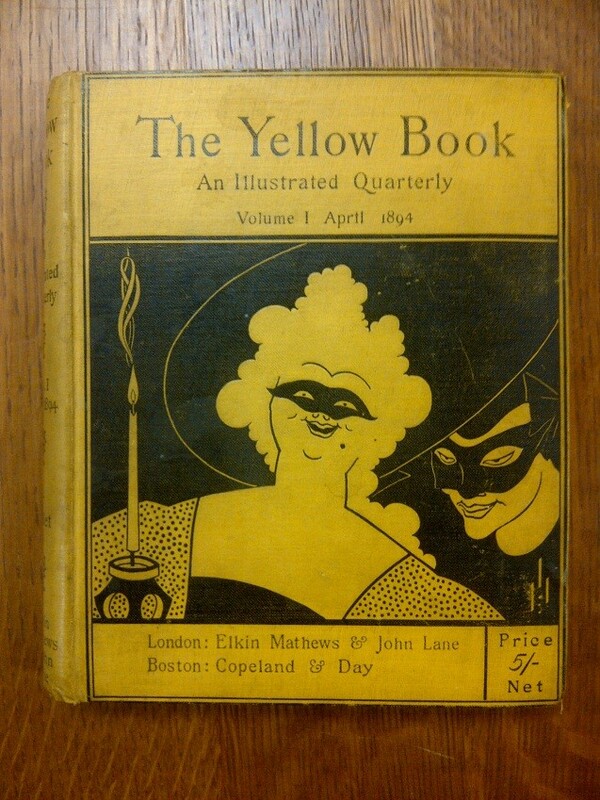 As per the site’s “Welcome” page, it logically centers itself not only around the study of decade of the 1890s, more specifically around the periodicals of that decade, and more specifically still about the particular periodical that gave the decade its “yellow” moniker–The (infamous) Yellow Book. My digital essay discusses these digitally re-born texts and deals with issues such as form, adaptation/homage, simulation/skeuomorph, and materiality. Process: This project began its life as a traditional 20-page seminar paper I had done for a class in Fall 2012 so I’d already done a lot of research, writing, and thinking about digital archives in general and The Yellow Nineties Online in particular by the time I decided to revisit the topic this semester. The main challenge for me was taking that first incarnation and looking at it from a completely different angle–not that of “genres” of digital archive (my initial argument, tailored to said class), but rather looking at the ways in which the site frames content, form, and user engagement. These three themes are the one that I have tried to thread throughout each of my posts and which tie the digital essay together as a whole. Affordances: This project works so much better as a digital essay than a paper that I’m profoundly glad I had the opportunity to transform it! Because I am working to analyze an online resource, it was helpful to work in the same medium–particularly as it is one that facilitates greater use of images (something I’m always looking to do since I work so heavily in visual culture) and enables the use of hyperlinks– these two affordances (or rather, the lack thereof) were the main constraints in writing this up as an seminar paper in the first place. Looking back at my original paper, I also noticed that it formed less of a coherent argument than a series of observations about the site and its methodological moves. The project worked well enough as a traditional paper, but splitting it into sections in my digital essay not only helped me to re-think the different topics I was actually considering, but also allowed me to make those points much more succinctly without worrying over-much about whether I was presenting a unified whole–it was unified by virtue of admitting its nature as a looser collection of interrelated facets. This project is something I hope to tinker further with and link to my as-of-now under-development professional WordPress site. I also plan to send the link to the creators of The Yellow Nineties Online (which I am simultaneously excited and terrified to do). Constraints: The infelicities of my chosen Wordpress theme (including but not limited to problems with font size/color, spacing, linking, arrangement and display of pictures, etc.) did take some amount of time and troubleshooting to wrestle into submission (I won’t say all of that wrestling was particularly good-humored). Besides technical difficulties, the second challenge (mentioned above) was how to “digitize” my original essay, particularly in terms of organization. I cannot even guess how many different subheadings I created and discarded, split, and combined as I tried to organize my themes as clearly as possible without feeling like I was spending too much time on one and giving short shrift to others. These many changes to page themes (and therefore titles) unfortunately also had the unintended effect that most of my body pages still bear now-defunct titles in their web address. This annoys me somewhat, but I don’t think there’s anything I can do about it now. Overall, however, I’m really pleased with how the essay turned out, aesthetically and organizationally.